I turned into a real rebel with this effort. I definitely wanted to go with the low sugar version of this jam. I didn’t know exactly how many pounds of cherries I needed to buy, so I decided that however much I bought I was going to turn into jam. The Ball pectin that I use is called “Flex Batch,” implying that you can increase or decrease the recipe by varying the amount of pectin and other ingredients. Within reason, of course, as jam and jelly recipes are not meant to make really large batches. They just don’t work when they get too big. The low sugar recipe calls for 3 2/3 cups of prepared cherries, and I wound up with six cups. Not only did I adjust the recipe, I decided to make it all in one batch in the automatic Jam & Jelly Maker. You are not supposed to make a batch that will yield more than two pints in the J&J Maker, but I had read reviews from various users where they had even doubled the batch size without any problem. My experience with the strawberry and peach jam told me that the contents of the pot did not get too high while cooking, so I thought I should be okay to do all five cups of cherries at one time. 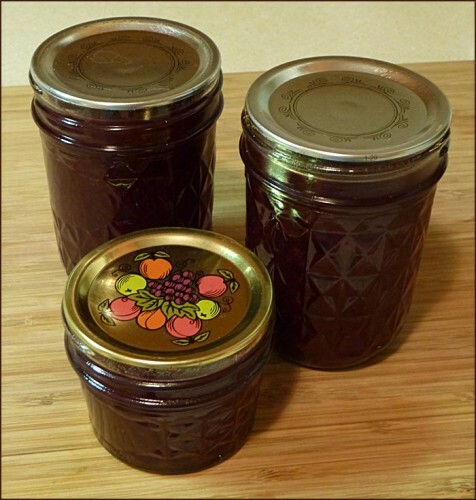 I don’t have a lot of pictures for the cherry jam – only two really – the one at the top and this one – I don’t eat sweet cherries and have never cooked with them, and it has actually been many, many years since I cooked with sour cherries. It dawned on me that I needed a cherry pitter. 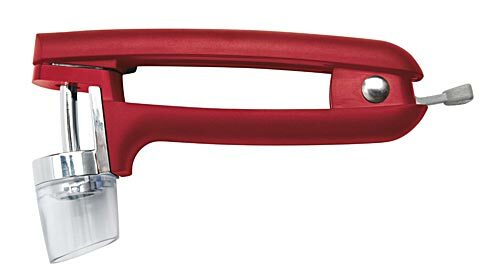 After reviewing my options, this OXO Good Grips Cherry and Olive Pitter seemed like the best bet. Yeah, you only pit one cherry at a time, but it’s not like I’m going into mass production. I found the pitter at my local Bed, Bath & Beyond, but at $12.99 I thought I should be able to find a better price elsewhere online. Hmm, no such luck, same price online. However, I did have a 20% off one item coupon from BB&B, so back to the store for the best deal. I washed the cherries in a colander a few at a time and then pitted those few right after washing them. I’m paranoid about leaving pits in the cherries, although it’s unlikely you are not going to see any missed pits as you are spreading jam. To help alleviate my concern, I pitted into a plastic container, listening and watching for the pit to fall into the container and emptying the container after each small batch. While the cherry pitter worked pretty well and is well constructed, it was nowhere near 100% consistent in removing all the pits. Still, as I was watching so closely I was able to catch the cherries that didn’t pit and do it manually (although I did find half a pit as I was putting the finished jam into jars – you just better plan on missing one). So, here I have bowl full of pitted sweet cherries. The instructions for almost all jam is to cut up the fruit and then mash it (usually in a single layer) with a potato masher. Do you know what a pain it is to try to cut up sweet cherries? Small, round things that do not want to stay under a knife? I finally succeeded in cutting several up and went to mash them. Did you know that sweet cherries are pretty sturdy little fruits? They don’t like to be mashed any more than they like to be cut up. I suppose if you like really chunky jam you just proceed like that. Me? It just was just too much work and looked like it would result in some pretty inconsistent product. Out came the food processor. A few minutes later and wham, bam, there you have it – cherries chopped and ready for cooking. Yes, I’ve read that you shouldn’t use a food processor because, at least with some fruits, it reduces the effectiveness of the pectin that is in the fruit. I don’t know if this is true for sweet cherries, but I didn’t care. It worked much better than the chop and mash method. Loading up the J&J Maker, the larger amount of ingredients didn’t seem to fill it too fully. It looked reasonable to me, so I set to “jam” and added two minutes to the cycle time, thinking I should since I was cooking more. Other than the increased recipe and extra cooking time, I processed the batch normally. While the contents did riser higher in the pot when they reached the boiling stage, they didn’t come close to overflowing the pot, which I was very happy to see. That would have been a hassle to deal with. I canned and processed the jam in jelly jars as usual in the hot water bath canner. I ended up with six half pint jars and one 4 oz jar. I let them cool completely and afterwards removed the rings and washed off the outsides of the jars. With my strawberry and peach jams, if I turn the jar of jam on its side, the jam stays put. I found that my sweet cherry jam wasn’t quite so sturdy. The 4 oz jar is fine and doesn’t do anything when I tilt the jar, but the half pint jars seem a bit loose. There is one jar in particular (why just one jar?) that seems to have a particularly soft, dang near liquid, set. I haven’t opened a jar yet to try it, so I’m not sure how it will spread. I suspect that if it is stored in the fridge it will firm up a bit, but still be softer than the strawberry or peach jams. That’s not necessarily a bad thing, but I do want to be able to spread it instead of ladle it. It got me to thinking, though, about Thanksgiving or Christmas. How did I make that leap? The more liquidy jar of sweet cherry jam looked to me like it could be the base for a great ham glaze! Who says jam is only good for spreading on bread? That’s it for . . . sweet cherry jam, bum bum bum, good times never seemed so good . . . sigh, sorry, back in the 70’s again. Gotta go play that song.